Opposition leader declares at Rabin memorial he will no longer hold any coalition talks with Netanyahu. Elkin: Good riddance. 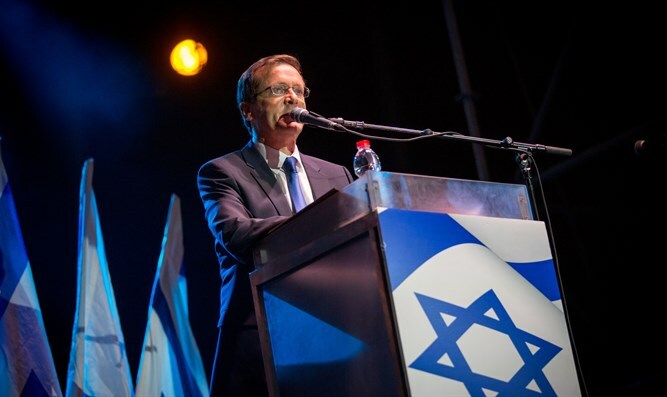 Opposition leader and Zionist Union chairman MK Yitzhak Herzog declared on Saturday night that he would no longer be holding any talks with Prime Minister Binyamin Netanyahu about the possibility of a unity government. Netanyahu tried to convince Herzog to join the coalition several months ago, but the talks on a unity government reportedly fizzled over Herzog's demand for a unilateral division of Jerusalem, among other things. Eventually, Netanyahu added Yisrael Beytenu to the coalition, appointing its chairman Avigdor Liberman to the position of Defense Minister. However, in recent weeks there have been several media reports of renewed coalition talks between Likud and the Zionist Union. According to one of those reports, Netanyahu agreed during negotiations with Herzog to freeze construction in Judea and Samaria. The Prime Minister’s Office denied the report. Herzog rejected the most recent reports that talks took place over the Rosh Hashanah holiday, but at the time also refused to commit to not entering Netanyahu's coalition. On Saturday, Likud Minister Ze’ev Elkin welcomed Herzog’s declaration that he would no longer hold talks with Netanyahu. "Herzog said that the time for talks on a unity government has ended. Good riddance! So there was dialogue in recent months? Despite the denials after Rosh Hashanah? Confused? So are we," Elkin tweeted.